By Thursday, the winds were now favorable for the migrating birds. But I visited Fort Desoto Park in Pinellis County anyway. Found that most of the warblers, vireos and such had moved out, but lots of Rose breasted grosbeaks and Scarlet Tanagers were around. A few thrushes too - including Wood Thrush, Swainson's Thrush and Veery. 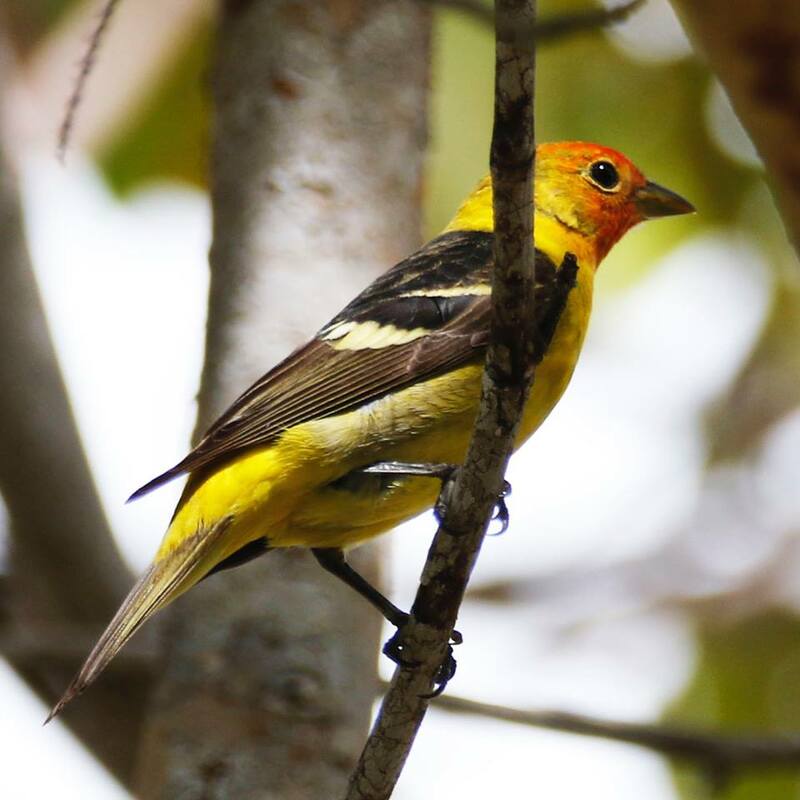 Other migrants included Baltimore and Orchard Orioles, Indigo and Painted Bindings, Summer Tanagers. Other birds seen included Caspian Tern, Least Terns, a Lesser Black backed Gull, Marbled Godwits, Red breasted Merganser and Nanday Parakeets. Arrived at Babcock Webb just at dawn and headed to the Red Cockaded Woodpecker site on Tram Grade road. Within just a few minutes I witnessed all of the 'Big Three'. They include a Red cockaded Woodpecker, several Brown headed Nuthatches and a couple of singing male Bachman's Sparrows. Numerous Bachmans Sparrows were singing throughout the property this morning and I was able to get a few photos of these normally shy birds. Also found my first sighting of a Hairy Woodpecker for the year, plus a pair of Brown Thrashers, calling Northern Bobwhites, Eastern Towhees and Eastern Meadowlarks. Also saw lots of Black crowned Night herons, Great created Flycatchers, White eyed Vireos, Sandhill Cranes and a lone White winged Dove. Met a couple, birding from Miami who were pointing out a pair of Eastern Bluebirds checking out a RCW nest hole. At this point, FWC biologist, Kellie, joined us and offered further insight on Bluebirds and Great created Flycatcher using RCW nest holes. Kellie spent time with us, discussing the various species on the site, like the RCWs, the Bobwhites population and control burns. And very interesting to me, was the research and management of local bat population. Including Florida's rarest bat - the Florida Bonneted Bat. As we were conversing, a singing Bachman's Sparrow popped up next us, providing a great photo opportunity. Kellie also provided the use of her scope as scanned a pair of young Great Horned Owls consuming a snake. Last weekend a cold front with strong head winds brought in a nice variety of migrating birds to Sanibel Lighthouse Beach Park. I personally visited the park on Monday morning for a few hours, along with a great many fellow birds, so playing hooky from work to enjoy this mini fallout. Meg Rousher put Dave & Tammy McQuaide as well as myself on a great bird - a calling Black billed Cuckoo. Black billed cuckoos are very uncommon find in Florida. I came close to adding swainsons warbler as there were several around today, but I just missing them as they relocated out of sight. I did miss a few other species. But I did get to see an Eastern Kingbird, Prothonotary Warblers, Tennessee Warblers, Yellow Warblers, a single Palm Warbler, Black throated Green Warblers, Summer Tanagers, a Blue Grosbeak, Indigo Bindings and a Baltimore Oriole. There were so many birders on hand that it sometimes got quite crowded. But I did miss a few species included another rare in Florida, western tanager, plus veery, swainson's thrush, dickcissels, those swainson's warblers, blue winged warblers, a lark sparrow, a Ceurlian warbler, Kentucky warbler, Merlin, Acadia flycatcher, gray songbirds, yellow throated videos, cliff swallows, worm eating warbler, golden winged warbler, hooded warbler, American redstart cape may warbler, blackburnian warblers, chestnut sided warbler, black throated blue warbler, scarlet tanager. In the following days I checked for migrants at Bowditch Beach Park on Estero Island and at Six mile Cypress Slough Preserve. I added Red eyed Vireo, Veery, Yellow billed Cuckoo, Hooded Warbler and American Redstart. The first couple of weeks of April were a bit frustrating as far as how the Spring Migration has progressed. But as of Sunday birding activity has certainly picked up. Today we had an unusual sighting of a flock of upland sandpipers in north Cape Coral. They were first reported by Alli Smith and have been feeding and resting in the grassy, Festival Park location, were we would normally be looking for resident Florida Scrub Jays and Burrowing Owls.